Lottie’s burial is in the Spencer Family Cemetery because she was married to Richard Augustus Spencer. With her marriage to Richard, the name Gadsby came into the Spencer line. 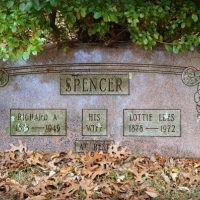 Richard Augustus (“Uncle Rich”) is the older brother of William J.B. Spencer and Alfred Ernest Spencer (gravestone No. 40). Richard Augustus was the eldest child of Anna Maria (Mar-eye-ah) and John Johnson Spencer (Gravestone No. 8). Anna Maria was the child of Richard Anthony Spencer (Gravestone No. 7). Richard Anthony’s father was Richard Anthony (“Deacon”) Spencer. Father and son had the same name. Richard Anthony (“Deacon”) was the sixth child of John (Gravestone No. 2) and Huldah (née Johnson) Spencer (Gravestone No. 1). Uncle Rich and Lottie Lees (neé Gadsby) Spencer and their three daughters lived in the Spencer house at Spencer’s Corner (Division, Shippeetown and Crompton Roads in East Greenwich, R.I.). 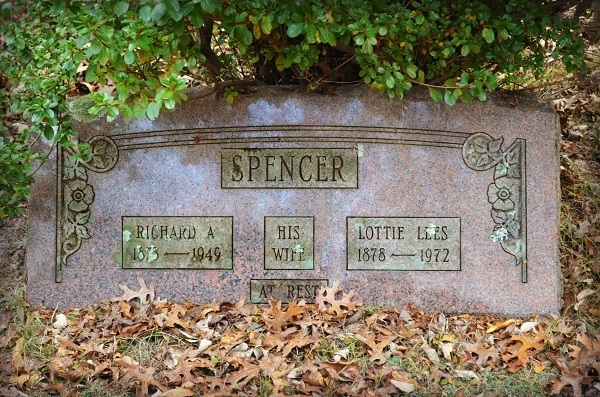 Two of Richard and Lottie’s three daughters are buried in the Spencer Family Cemetery. They are Annie Eleanor (gravestone No. 43) and Amy Lees (gravestone No. 43). This web author was interviewing Audrey Mae at her second daughter’s Crystal’s home late February, early March 2003. Mother was ninety-one. Audrey Mae recalls:” Richard and Lottie’s three daughters were Amy, who was a beauty and won a contest in Providence, Eleanor who we all called Girlie, and Eleanor.” All were older than Audrey Mae. Additional information about Lottie from “Glimpses of the Past: Morning Conversations with Audrey Mae” at age ninety-two in 2004: “She married Rich. All she had to do was bring her money over here. She had a lot of money, but she had to leave the money in England.”…”They (Rich and Lottie) had Amy, Leah Louise, and Girlie. I always love the sound of Leah Louise, what a pretty name. The three girls lived in the city and went to school at Auburn in Providence. They came home in the summers. Richard drove a train, so he was never home. I think he was only home on the weekends. He drove an old fashion auto that he drove to the country. The auto had only one other seat.”. 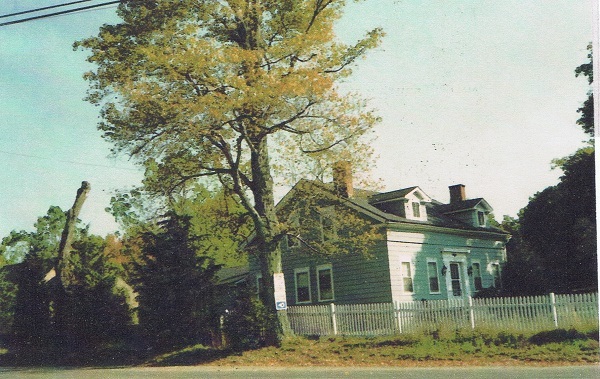 Descendants believe that Uncle Rich, Lottie and the girls inherited the Spencer house and farm land on Spencer’s Corner, Division, Crompton and Shippeetown Roads Intersection. Lottie Lees Gadsby lived twenty-three years beyond her husband, Richard Anthony(“Uncle Rich”) Spencer. The name Lottie Lees is the markings on gravestone No. 42. According to the above information, her birth name was Lottie Lees Gadsby. Below is Audrey Mae’s gravestone and generation numbering system of Richard Augustus (“Uncle Rich”), Lottie Lees (née Gadsby) Spencer and two of their three daughters. This entry was posted in All Gravestones, Audrey Mae's two uncles and their families, Married into the Spencer line, on March 24, 2013 by Heather.